Samburu National Reserve was hard to access for many years and still enjoys a wonderful natural serenity. Due to it’s many open savannahs, the abundant wildlife is easy to spot. Because of the long distance to Nairobi – some 350 kilometers – it remains one of the lesser visited parks. It’s perfect for those who don’t mind to travel a bit further to have a great piece of African nature all to themselves. Covering 104 square kilometers in the north of Kenya, this park is one of the smaller wildlife resorts. Next to the park are the Buffalo Springs and Shaba National Reserves, which can all be visited with one ticket. The landscape consists largely of savannahs, scrub desert and verdant river foliage. Two peaks, Koitogor hill and Ol Olokwe mountain, adorn the horizon. 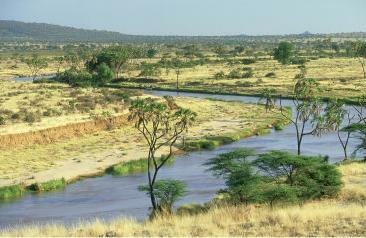 The Ewaso Ngiro river meanders at the south border of the park. In the past, there have been some security problems in the park, with armed bandits holding up tourist vehicles and locals, but these seem to have been solved after some effective KWS measures. Only the road up from Isiolo still counts as not entirely safe. Check with local police or park wardens before taking this. The park enjoys a huge variety of animals and birds, especially in the dry seasons as the presence of plenty of water draws animals to the park. Most animals are present in the southern part. The Beisa oryx, Somali ostrich, Grevy’s zebra and reticulated giraffe are considered unique to the region. Furthermore, cheetahs, impalas, waterbucks, leopards, Grant’s gazelles, gerenuks, African buffaloes, and Kirk’s dik-diks can be seen in the park. Elephants can be found at the shores of the Ewaso Nyiro river, where they drink. This river also harbors Nile crocodiles. Due to poaching, rhinos are no longer present in the park, but lions are seen again regularly. Leopards can be seen near some lodges (see below). There are also over 350 bird species present in the park, including sunbirds, pygmy falcons, kingfishers, hornbills, Egyptian geese, tawny eagles, bee-eaters, marabou storks, guinea fowls, vultures, and bateleurs. The park is an all-year destination. The park is especially suitable for game drives. The park has 4 campsites on the north bank of the Ewaso Nyiro river. None of them have facilities, except Buffalo Special Campsite, which has toilets and showers. 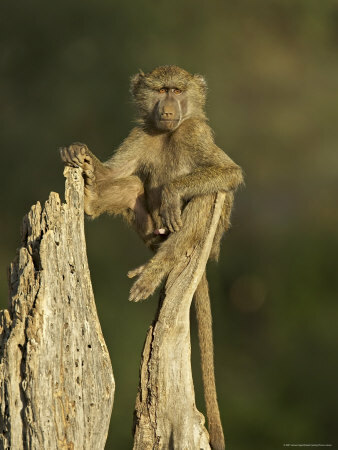 Watch out for the baboon monkeys at these campsites, because they are known to steal everything you leave unattended (they seem to have a preference for expensive electronic equipment). The upmarket lodges – especially the Samburu and Samburu Serena lodges – unscrupulously feed bait to the wild animals in the park each day, so staying there heavily increases your chances of seeing them. Especially leopards seem to be attracted. It’s not very authentic, but let’s face it: your chances to see a leopard any other way are very small. Elephant Watch Camp is a luxurious eco-friendly camp, close to the place where many elephants reside. Larsens Tented Camp is an upmarket place with luxurious tents near the river and excellent food. It also organizes game drives. The park has it’s own airstrip. Entry fees for non-Kenyans are $20 for adults, $10 for children.